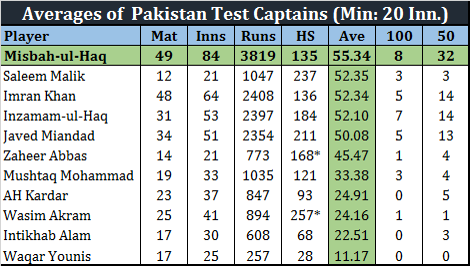 Misbah Ul Haq is currently captaining Pakistan in a test match for the 49th time, 1 more than the number of times Imran Khan captained Pakistan. 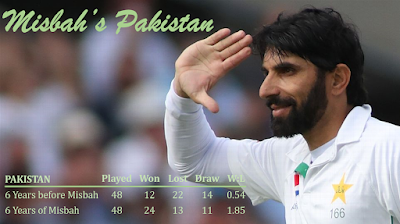 Misbah has not only captained Pakistan in more matches than anyone before him, he has also won more and scored more than any Pakistan captain before him. On many other fronts, he has surpassed all other captains from not only Pakistan, but also the subcontinent! He is undoubtedly at the helm of the most successful test team Pakistan has ever had, and is without a doubt the best test captain Pakistan has ever had. 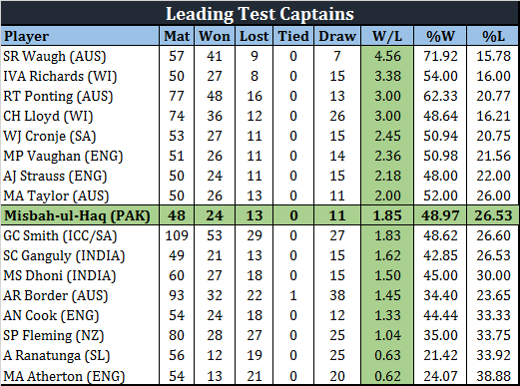 While there are a few captains from around the world who have had far more success, Misbah is the clear leader among all captains from the subcontinent. With 24 wins, he is well ahead of Imran Khan and Javed Miandad, and just behind MS Dhoni who registered 27 test wins. 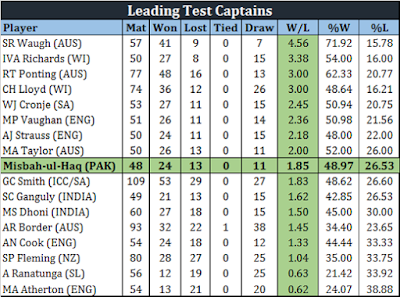 However, in terms of series wins, Misbah now has 10, which is the most by a captain from the subcontinent. The current series win over the West Indies took Misbah ahead of Dhoni and Ganguly who has 9 series wins each. Misbah has 10 more test victories than Imran Khan and Javed Miandad did as captains. He is well ahead of them, and will remain as Pakistan's most successful captain ever for a long time to come. The past 6 years under Misbah have been magical for the test team. There is a stark difference between Pakistan's performance in the 6 years before Misbah and the 6 years under him. Out of all Pakistan test captains who have batted in at least 20 innings, Misbah has the most runs, highest average, most hundreds, and most fifties. He is at the top of the pile and will probably remain there for a very long time. 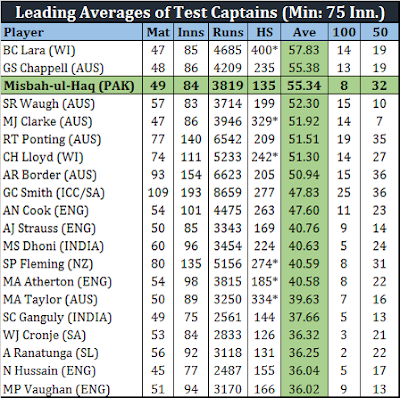 Among all captains who have batted in at least 75 test innings, only Brian Lara averages more than Misbah does. Which test captains are most remembered for their sterling batting performances at number 5? For me, Steve Waugh tops the list. Inzamam, Allan Border, Arjuna Ranatunga, and Hansie Cronje also come to mind. 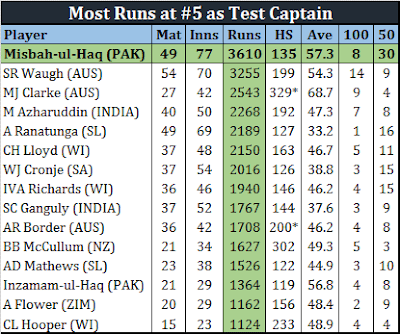 Misbah is above all of these names and many others as a batsman at number 5 while captaining his team. 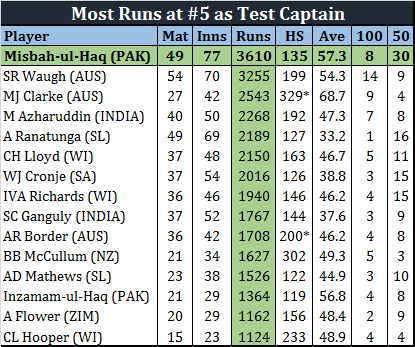 He has more runs than anyone else, and only Michael Clarke averages more than him as a number 5 test batsman as captain. When Misbah ul Haq and Younis Khan posted their 15th century partnership during the second test against the West Indies, they also went past Younis Khan and Mohammad Yousuf's record tally of 3,137 partnership runs for Pakistan. Misbah and Younis now stand 5th in the world in terms of most century partnerships ever in test cricket. Not to mention that they are right at the top for Pakistan. Their average is also right up there with very few pairs of batsmen (Hobbs & Sutcliffe and Langer 7 Ponting) ahead of them. 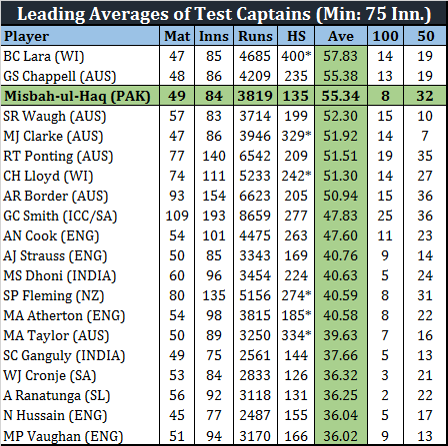 To think that Misbah has achieved most of this after the age of 35 is nothing short of remarkable. Most captains have retired before that age. Misbah is 42 now and still going strong, creating record after record for Pakistan in test cricket. He has captained them to the top of the rankings (currently at two), he has led them to victories over all nations in the UAE where Pakistan remain unbeaten for 6 years, and he has created one of the most successful test sides in the history of the game.